At this stage of the retirement plan, we can determine the annual savings needed to build the future savings goal. 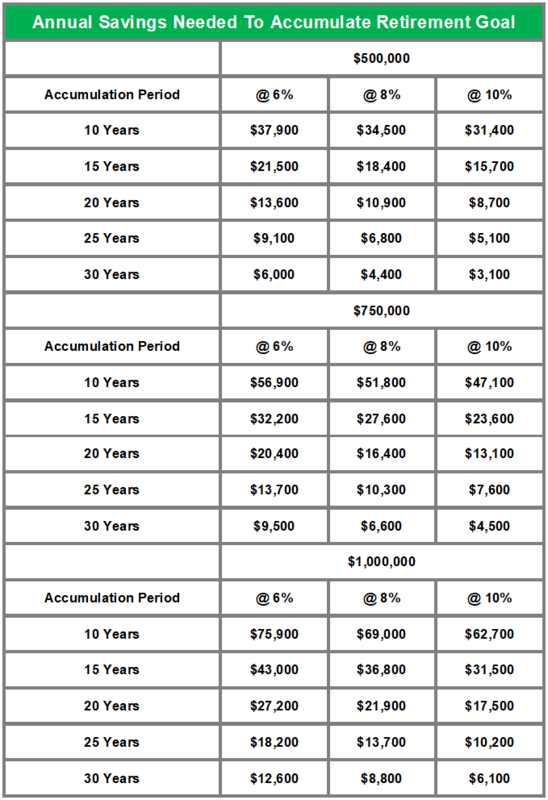 The table below shows the approximate annual savings needed to accumulate specific amounts over various periods at various assumed rates of return. Our client Ted is going to need to set aside $23,000 to $32,000 a year to fund his retirement as he currently envisions it. If that’s not possible, he may have to alter his current retirement goals. For instance, he may have to delay his planned retirement date or cut back on his income objective. Don’t delay. Start now and save consistently. To the extent possible, direct retirement savings into tax-advantaged plans and accounts. stocks, bonds, mutual funds, money markets, certificates of deposit and life insurance.